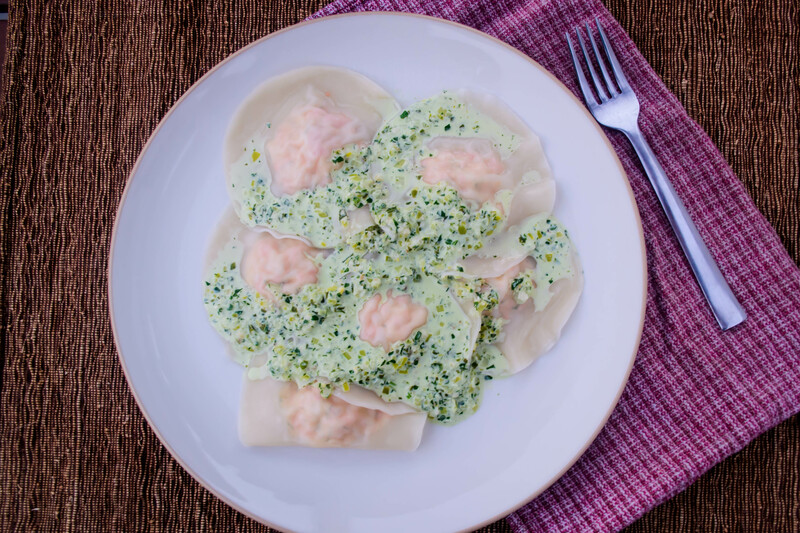 Smoked Salmon Ravioli with Leek Pesto Cream | "blackberry-eating in late September"
Call it my literary background, but I love a good origin story. When random thoughts occur, I like to trace them back through my train of thought to see what the sequence was (why did I just think of that bartender in Eugene? I was considering more efficient ways to load the dishwasher just a few seconds ago!). Ask me sometime about one of my nicknames for our dog. You’ll see what I mean. This spills over into my cooking as well. I suppose if I were a real writer, I’d resist or deny the question “where do you get your ideas?” as so many of them do (although some do answer the question, in wonderful and terrifying ways). So I like to take you back where I came from. In this case, we’re going back to a tired, tired late afternoon in August. N. and Lucy and I had started the day in Brookings, OR, wound our way down the beautiful stretch of Highway 101, twisting through dusty redwoods, pastoral dreamland, and ragged juts of ocean cliffs. In the parking lot of a grocery store in Fort Bragg, we decided enough was enough. We just weren’t going to make it to the Bay Area that night. It was time to call the driving day finished. I stopped at 24 ravioli, each one loaded with a spare ½ tablespoon of filling, but had enough smoked salmon mixture left that I could have easily made 36. I figured we would each eat 12, but they were so rich and lovely that, particularly with a piece of garlic rubbed toast on the side, you could probably get away with serving 8 to each diner. You will have enough sauce for the full 36, if not more. This dish is, perhaps, better suited for spring, bursting as it is with fresh herbs and buttery leeks and the pinks and greens of new growth. But it’s so good, so perfectly silky and creamy and fresh and tangy, that I think you should make it anyway. To make the raviolis, heat 2 tablespoons of butter in a small pan over medium heat. When it has melted, add the shallot and garlic and cook, stirring frequently, until they become translucent. You don’t want them to brown, you just want to sweat them gently to remove the rawness. When they are tender, turn the heat off and let them cool. While the shallots and garlic cool, mix together the cream cheese, smoked salmon, 1 tablespoon dill, egg, and 1 tablespoon heavy cream in a mixing bowl. A fork or a spatula works well. Combine into a fairly homogenized mixture, though you will still have chunks of salmon, which is fine. Once the shallots and garlic have cooled, add them to the salmon mixture. 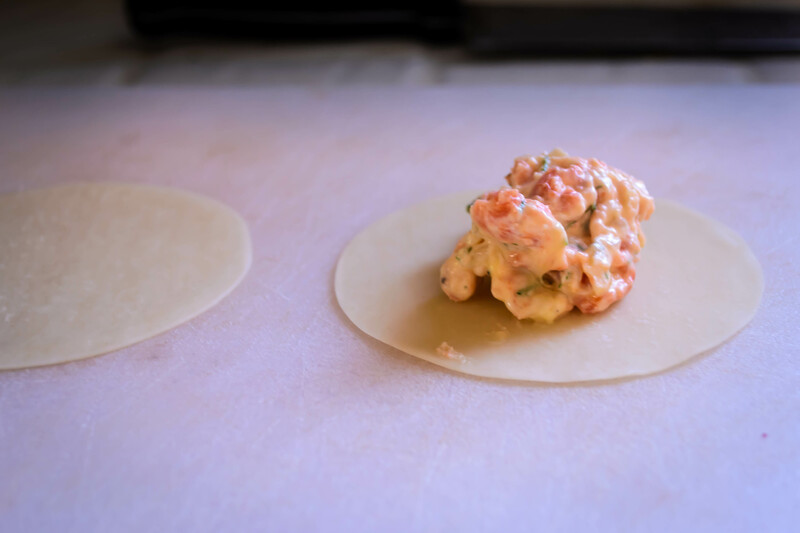 To form the raviolis, set up an assembly line: salmon mixture on one end, then won ton wrappers on a cutting board, then a small bowl of warm water, and finally a cookie sheet dusted lightly with flour. Top one won ton wrapper with a scant ½ tablespoon of salmon mixture right in the center. Using your fingertip, dampen the outer edge of the wrapper with the warm water, then place a second won top wrapper on top. Press the edges to seal with your thumbs and forefingers, working air bubbles out so you just have a solid lump of filling in the center. I like to match up the poles of each wrapper – the very top and very bottom – so they are flush, then press together the sides simultaneously, one with each thumb and forefinger pair. 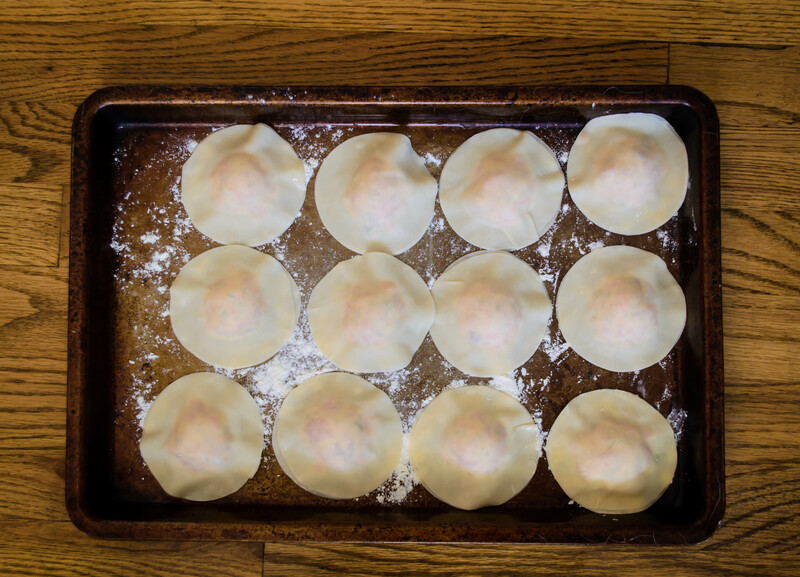 As you complete each ravioli, place in a single layer on the floured cookie sheet. When you have a full tray (I wouldn’t put too many more than a dozen on each sheet; you want them all touching the flour and not touching each other too much, or they will stick), refrigerate for at least 30 minutes. 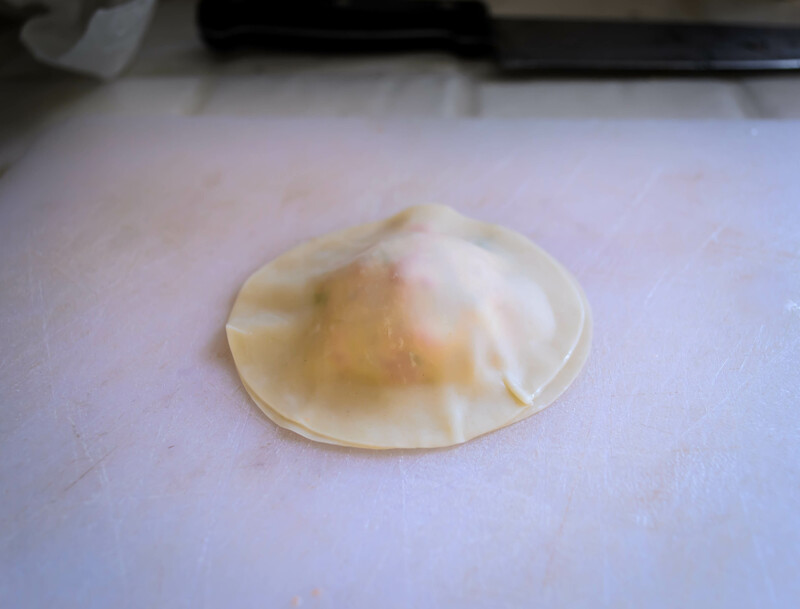 Once the raviolis have had at least 30 minutes in the fridge, all that remains is to heat a large pot of salted water to a rolling boil and drop them in. They are done when they float to the top, which only takes 3 or 4 minutes. Remove them with a slotted spoon (they are too delicate to pour into a colander) and add them to the sauce. While the ravioli are chilling, make the sauce. Cut off the root end and the dark green leaves of the leek. Slice the remaining log lengthwise, leaving two long rounded planks as in the photo above. Run these planks under running water, flipping through the layers with your thumbs, to release dirt. Then cut each plank in half lengthwise again, and slice horizontally across into thin ribbons. In the same pan you used to cook the shallot and garlic, heat the remaining 2 tablespoons of butter over medium heat. 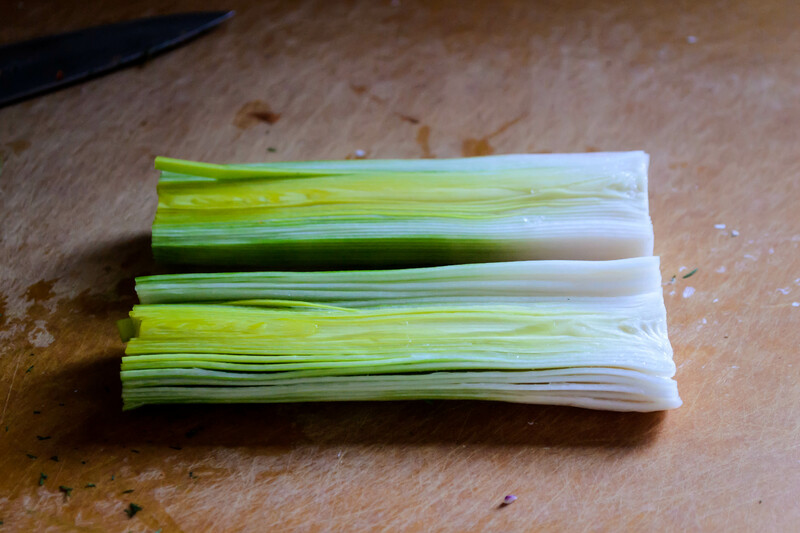 Once it has melted, add the leeks and cook for 5-8 minutes, stirring frequently, until the leeks are tender and smell garlicky and sweet. Add the wine and simmer 3-5 minutes. Season with salt and pepper and turn off the heat, letting the leek and wine mixture cool slightly. 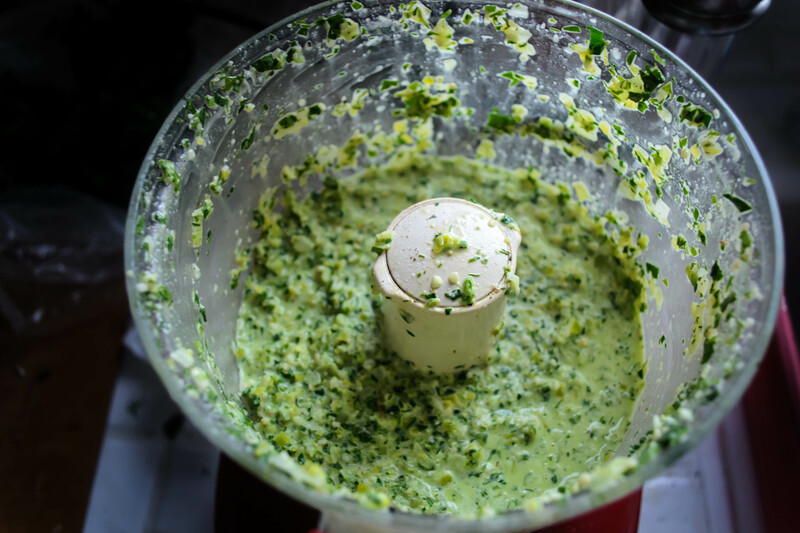 While the leeks and wine cool, add the parsley, dill, basil, garlic clove, and pine nuts to a food processor. 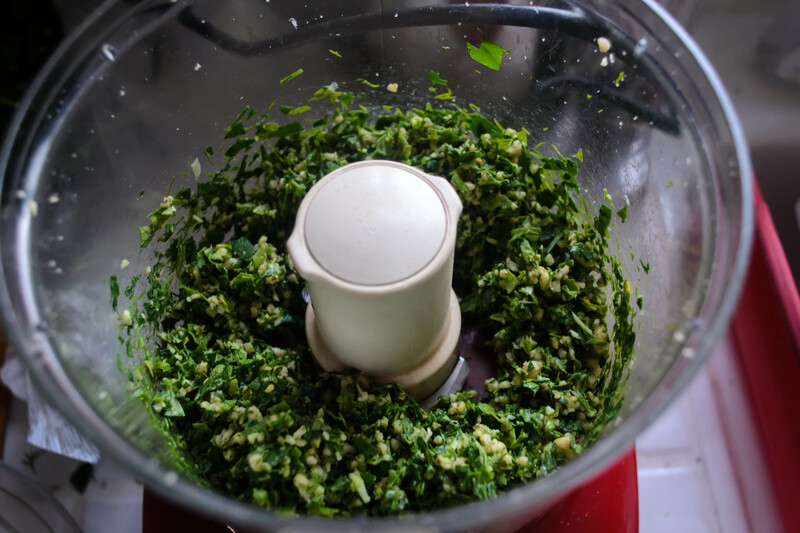 Pulse in 2 second bursts 5 or 6 times, or until everything is finely chopped and paste-like. Add the cooled wine and leek mixture and process until only very fine pieces remain. As soon as you drop the raviolis into the boiling water, warm the cream in the pan you used for the leeks and wine. When it reaches a bare simmer, add the leek and wine mixture back into the pan and stir to combine with the cream. Heat through. Season to taste, if needed, with salt and pepper. To serve, swirl the raviolis gently with the sauce. If the sauce is too thick for your liking, add a ladle of pasta water to thin it just a touch. 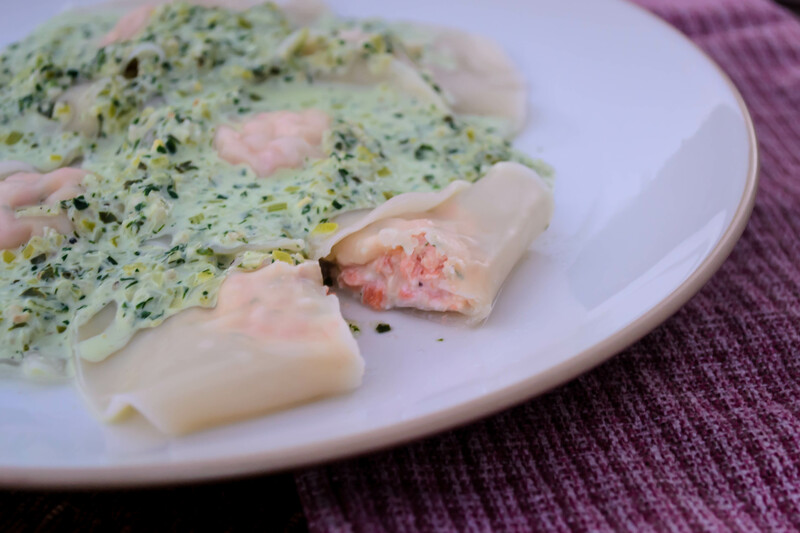 This entry was posted in Bibliophilic, fish, herbs, Recipes, Restaurant Recreation, summer and tagged herb cream sauce, leek pesto, salmon pasta with leek sauce, salmon ravioli, smoked salmon pasta by Chelsea. Bookmark the permalink.